Origami Paper → Double-Sided Origami Paper → Double Sided Flora Print Origami Paper Box 6"
The perfect origami paper for floral foldings! This box of Double Sided Floral Print Origami Paper contains 150 sheets of 5 7/8" paper, with bright and bold floral patterns and a complimentary solid color backing. The perfect origami paper for floral foldings! This box of Double Sided Floral Print Origami Paper contains 150 sheets of 5 7/8" paper. Each sheet of origami paper is faced with a bright and bold floral pattern with a complimentary solid color backing. Each origami pack contains 5 sheets each of 30 different floral patterns. Make this a staple of your origami paper collection. 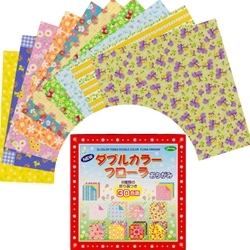 You may also be interested in the Harmony Box Origami Paper providing 150 sheets of gradient patterned paper.